Yesterday was Good Friday; the day we remember Jesus’ death on the cross. Crucifixion was a horrible way to die – to hang on a cross, usually for days, with nails holding the the limbs in place, and death coming most often by suffocation as the arms can no longer hold the body up so that the lungs can function. The news is again full of death recently – horrible death from terrorists bombs and from uncounted shootings. How is all of this related to joy? Christians know. Jesus died on the cross after three hours and then rose from the dead on the third This is joy. To know that Jesus took on this horrendous death so that we could be saved. There is also joy in art. 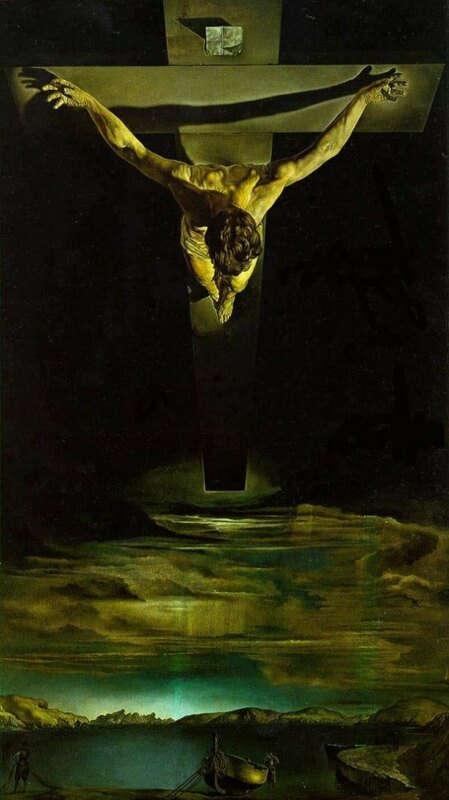 This picture from the internet shows Salvador Dali’s rendering of the crucifixion. For me this provides joy in the sadness. Joy comes in lots of other ways, too, in Garoua Boulai. We can get most basic foods here in the market for which I am grateful. Some things, though, are rarely, if ever, here. I found chamomile tea in the Total gas station store the other day! Yeah. A couple of store have also had corn flakes recently – a nice change of pace food. I found chocolate in the store, too, so I can have some for Easter – along with my hard boiled eggs (always available). The chocolate is from France and Oman, not Cameroon which produces a lot of the product, but chocolate is a US tradition for the holiday, so I bought some. I didn’t dye the eggs, mostly from laziness, but also because brown eggs don’t show the color as well. Still, I will have connections to my home traditions tomorrow. My friend, Sani, has been joyful all week because his wife had their first baby, a little girl he named Soumayyatou-Smith. Mother and baby are both healthy. Her they are 1 ½ days after birth. I am also joyful to see the rains come back with the accompanying green. There are even a couple more amaryllis flowers under my heavily-laden mango tree out back. My mangos are not yet ripe, but I can find some in the market ready to eat. Yum. know him and to chat about a whole range of topics! May your Easter be full of joy – even if it comes in small ways amid hardships. It is there if we look for it. And, in a time of much violence and negativity it is important to keep our eyes open for whatever brings us hope and joy.